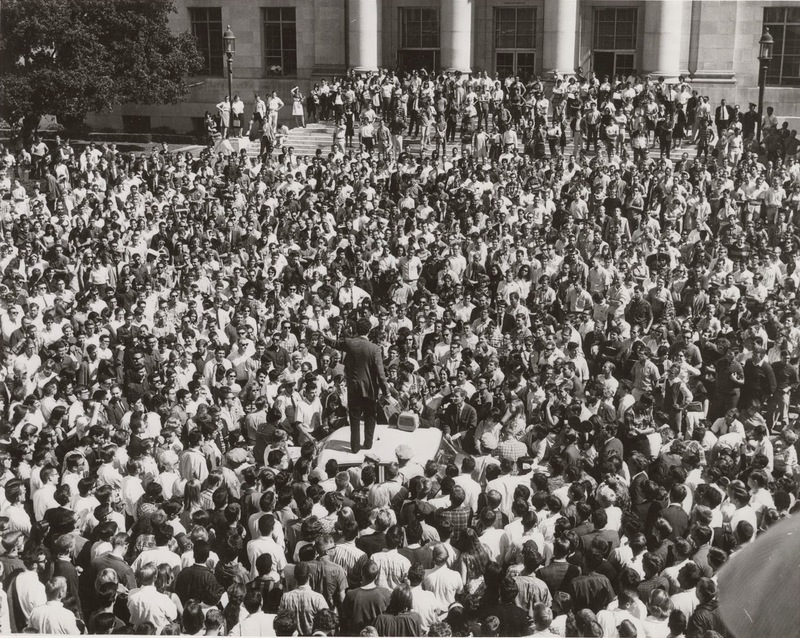 The Free Speech Movement (FSM) had its beginnings with students involved with CORE (Congress on Racial Equality) and the Southern civil rights movement. In the summer of 1964 some students at the University of California Berkeley had gone south to work with CORE and returned for the new school year in September. The school president, Clark Kerr, restricted political activities and suspended eight students of CORE. California and the United States were in the middle of the Cold War at the time, when any political activity outside of the norm was considered subversive and labeled as Communist. Kerr and many other Californians saw the spread of the civil rights movement to Berkeley in this light and tried to stop it. Over the next several months the FSM had a running battle with the school administration using rallies, marches, petitions and arrests to press their point. By December 1964, the students had won their demands and opened up political activity at Berkeley. The Free Speech Movement became a sign of the power of student activism that would be a trademark of the 1960s. -- Excerpted from Oakland Museum of California. Note: In early January 1965, Berkeley Chancellor Edward W. Strong was replaced by Martin Meyerson, who issued new regulations concerning political activity that largely reflect what the Free Speech Movement had been demanding. September 1964: "Notes on 'Camp'"